17th June 2017 Six Metre Open Dartmoor RSC . 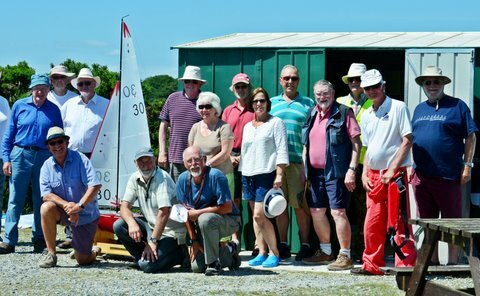 Race Report for the 6 Metre Event Held at Dartmoor Radio Sailing Club. Competitors arrived at Shaugh Lake dressed in shorts with t shirts and carrying sun hats, sun cream and water bottles in addition to their 6 Metre boats. The weather forecast indicated a very hot day with light and variable winds which if correct was certainly going to challenge the ability and patience of the competitors. The Club’s inaugural event began also with a challenge for the race team as to where to set the spread of windward marks. After consulting with 3 Club members who he hoped had geometry degrees the RO (Paul Newman) set the course, it seemed perfect except there was no wind! 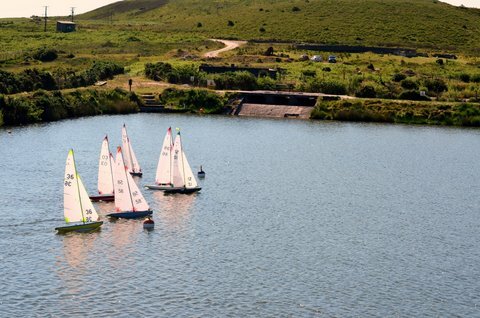 The first race eventually started after a gentle South Westerly breeze settled on the Olympic style two lap course. The challenge for skippers was how to keep their 6 moving through the areas of very little or no wind pressure on the course especially near to the windward mark. 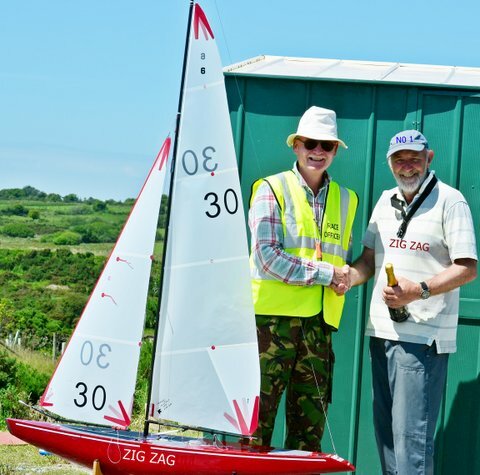 The first and second races were won convincingly by Mike Ewart from the two Islands club who showed both good tactics and his ability to read the light wind shifts. Hot on his heels were Steve Watts, Dave Kent, Martin Smith and Ralph Weller who are all relatively new helms to the class. Indeed nearly all of the DRSC competitors were new to the class this year and so lacked race experience with their boats or that was their excuse anyway! 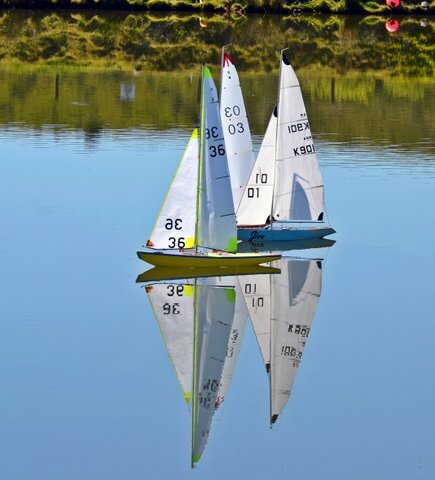 There were several stoppages between the races so that competitors could tinker with their boats and also to rehydrate themselves as the temperature increased. Races 3 and 4 saw Mike and Steve exchanging wins and to begin to break away from the rest of the fleet. However they were not going to have it all their own way as in races 5 and 6 both Ralph Weller and David Kent got to grips with the conditions and posted race wins. The temperature soared around midday but the wind speed didn’t rise with it. There were some involuntary drifting matches which were amusing to watch but not if you were caught up in them! The race course for some skippers during the morning became a trial, with lots of huffing and puffing due to frustration heard in the control zone, or were they simply trying to get their boats going! In an effort to get sufficient races in the racing continued up to lunch time (Race 8) albeit in very fluky conditions. The race leader board showed large ups and downs for some skippers as they either succeeded or failed to be in the right place on the course as the wind came and then died. After Lunch and with the wind direction still not particularly stable Race 9 started, after the leaders had rounded the weather mark on the second lap unfortunately one of the visiting skippers Geoff Earle who was resting in the clubhouse was taken ill. As several competitors rushed to his aid racing was halted and boats came ashore. After initial first aid it was decided that further medical aid was required and an ambulance was called. With two skippers involved in getting Geoff to the ambulance the fleet collectively decided to call it a day. With Geoff safely on his way to hospital a prize giving was held. Congratulations to Steve Watts (DRSC)for winning the Event, 2nd place went to Mike Ewart (APMYC) and third place went to Dave Kent(DRSC). Martin Smith(DRSC) with his dolphin finished in a well- deserved 4th place. Both Steve Watts and Mike Ewart thanked the race Team for their efforts with Steve thanking the competitors who had travelled to the event. Geoff Earle remained in hospital overnight and was discharged the next day. After collecting his car he has now driven to Kingsbridge to see friends and after that will slowly return home. Thanks to all from DRSC who helped with his care. Report compiled by Paul Newman, Steve Watts and Terry Brodie.